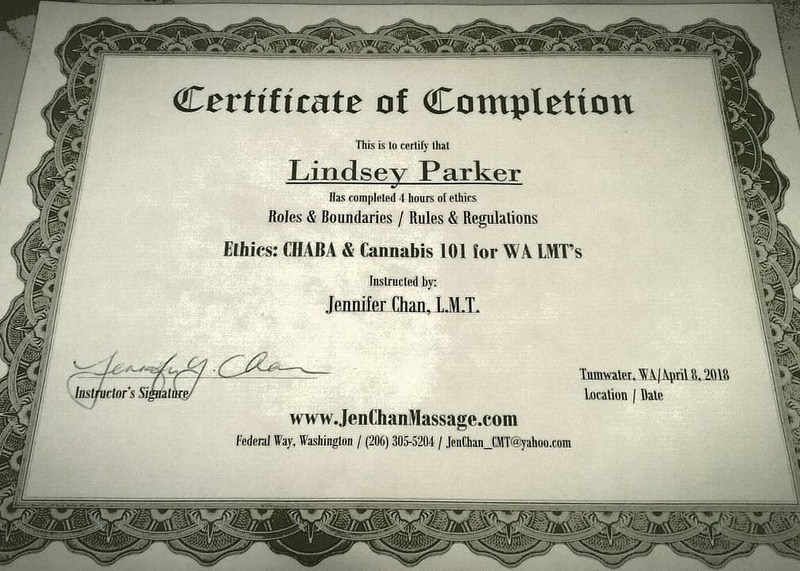 I recently had the pleasure of taking a continuing education course entitled CHABA & Cannabis 101 for WA LMTs by Jennifer Chan. The amount of knowledge I came away with is impressive! I’ll share with you some of the more relevant tidbits but feel free to ask me should you find yourself with a question I haven’t answered below! Q: Can I use a lotion or cream you already own in our next massage session? Q: Will you get high? A: Nope! Due to the extremely low THC content, the benefits are purely medicinal. THC, which stands for delta-9-TetraHydroCannabinol, is the psychoactive element that causes intoxication. CBD, the abbreviation for Cannabidiol, is the chemical compound that holds medicinal qualities which mirror the same endocannabinoid system¹ our body already has. Q: What are the *claimed benefits of CHABA? A: Cannabinoid receptors, which regulate and reduce the perception of pain, are located in the central nervous system, brain, connective tissue, glands, organs, and skin. With the use of CBD, they actually repress the pain signals your neurotransmitters send to the brain so the signal stops completely, causing your muscles and surrounding structures, like joints, to come out of self-defense mode and relax. Noted benefits include: reduces anxiety; anti-inflammatory; anti-spasmadic; speeds up the healing of closed wounds, scars, tattoos, rashes, bruises, and dry skin; anti-pruritic (itch); muscle relaxer; reduces symptoms from neuropathy; increases hunger and digestion; and some recipients have claimed relief from nausea, epilepsy, fibromyalgia, and multiple sclerosis. Q: Where can I find a study proving the benefits of CHABA products used in massage? A: Sadly, they don’t exist yet, because marijuana is still federally classified as a Schedule 1 drug² (that’s the same category as heroine, by the way! ), even though there have been no fatalities attributed to marijuana use on record. Washington is the first and only state currently allowing medical practitioners to legally incorporate CHABA products into their practices. 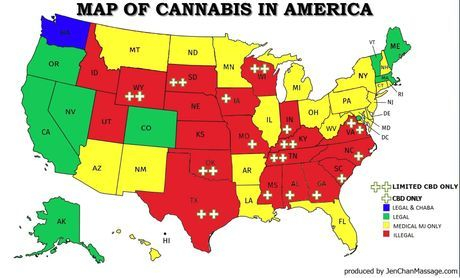 They fall into their own category as an exception to the Washington Initiative 502³, allowing recreational use in 2012. As of 2015, CHABA now has its own law⁴. Local organizations who believe in the healing properties of this plant are working hard to pass a bill to end marijuana prohibition. They attempted and failed in 2011, 2013, 2015, and 2017. But I hope and believe it is only a matter of time. Q: Can I buy CHABA products at my local recreational shop? A: Some, yes! However, it is actually illegal for bud-tenders at recreational pot stores to share medical knowledge about their products with customers. The good news is that most products will have the content listed somewhere on the packaging. If all else fails, you can visit their website! Q: Will it show up on a drug test? A: Though again there is no study available for the public eye, according to a local CHABA company, they had a patient use the product topically for 2 months consistently and had no trouble passing the drug test. I cannot guarantee that you will be fine (but you’ll probably be fine). Q: Will it interfere with your medication? A: You can find this answer by asking your primary care physician if your medication is affected by grapefruit! Q: Will it affect my baby if I’m pregnant or nursing while using CBD products? ♥ As a personal aside, this past weekend I went on my first hike of the year. 6+ miles, 2,000+ elevation, current fitness level: not super great. I stopped working out after my auto accident in January, about 3 months ago now, so I was not prepared. At the end of the hike, my knees were at a sharp, excruciating, and constant 8/10 pain. I went home, took an Epsom salt bath, and slathered them in one of my new CBD CHABA topicals, fully anticipating only mild relief in the morning. I woke up to, no joke, ZERO PAIN. None whatsoever. I could fully bend my knees and put my full weight on them. It was miraculous. Everyone will be affected differently but I personally and professionally believe that anyone can benefit from this medicine. If you decide you would like to try this in your next massage, you will need to sign an additional release form before our session. I will bring several types of topicals for you to choose from, including oils and creams, that you can either add as a spot treatment on up to 3 areas or as a whole body treatment. – Did you know CBD counteracts the psychoactive effects of THC? So does black pepper! – If the positive effects you receive from CBD start to plateau, you can incorporate THCA into your treatment! – CBD and THC store in fat and slowly release over time. – You lose 50% of the efficiency of CBD by smoking it. – The flavors found in vape pens have recently been revealed to kill white blood cells. – There is an ongoing study of cannabis use by a 12 year old with severe epilepsy. Children under the age of 10 are less receptive to the effects of marijuana. Several cases are underway in which children with rare diseases are experiencing more benefit from cannabis use than more traditional medications. – Animals also have an endocannabinoid system and can benefit from cannabis use, but there is a slim possibility of toxicity leading to death from improper ingestion. 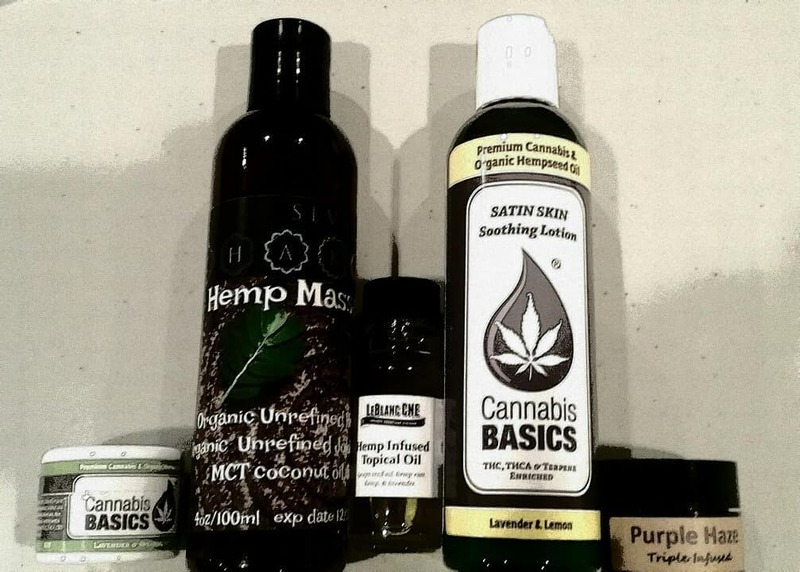 – Hemp is a variety of the Cannabis sativa plant that is grown specifically for it’s industrial uses. You can’t get high off of it but it can be used to make all kinds of things like clothing, canvas, paper, skin care products, and “hempcrete”, a bio-composite building material that is flame and mold resistant. A handful of the newest luxury cars on the market feature hemp interior! – In 2016, the cannabis industry brought in 6.7 billion dollars. In 2017, 9-10 billion. The estimated take for 2020 is over 20 billion. ← Welcome to Tips and Tricks!